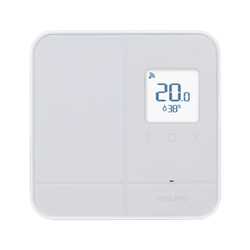 StelPro’s Maestro SMT402 baseboard thermostat works with 120V, 240V and 208V electric baseboards, convectors and fan heaters and makes a beautiful addition to your Maestro Controller thermostat for control of multiplle heaters in the same home. The Maestro thermostat has on board Zigbee HA support so it can also be used with compatible Zigbee certified automation controllers such as VeraPlus, VeraSecure or SmartThings. As an addition to the Maestro controller thermostat, you'll be able to control multiple heaters, set up rooms and zones, schedules, automatic home/away modes and track energy consumption through the free Maestro cloud service. When used with a Zigbee automation controller, a Maestro SMC402 is not required. Simply use as many SMT402 Zigbee thermostats as needed. The Maestro SMT402 has an adjustable backlight and motion-activated screen that automatically turns on as you approach. It features stunning styling and comes in a white molded plastic finish. 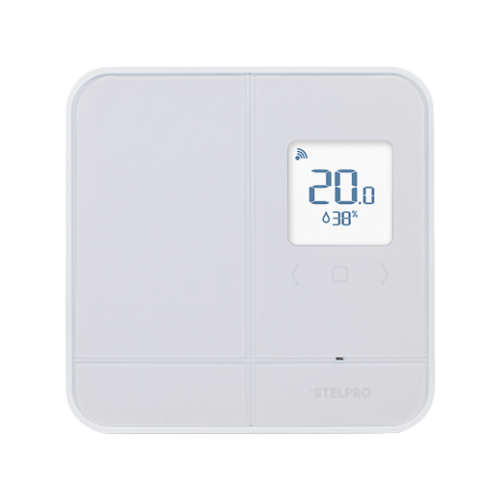 Note: The thermostat requires a Maestro™ SMC402 controller thermostat or other Zigbee automation controller. Thermostats do not repeat Zigbee signals. For larger installations a SMAMPLTZB range extender or SMREPETZB repeater(s) may be required.